The Historic Centre of Puebla is one of the oldest colonial cities in the continent and among the best-preserved in Mexico. 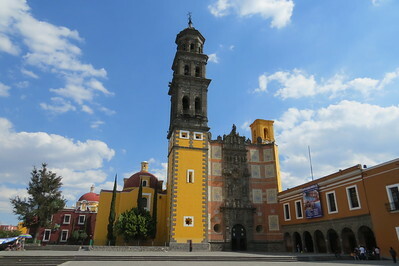 The city of Puebla was founded on April 16, 1531 as "La Puebla de los Ángeles". It was the first city in central Mexico founded by the Spanish conquerors that was not built upon the ruins of a conquered Amerindian settlement. Its strategic location, half-way between the port of Veracruz and Mexico City, made it the second most important city during the colonial period. From Mexico City’s TAPO bus station I took a comfortable Estrella Roja bus to Puebla. The journey takes 1 hour and 45 minutes (on a traffic-low Saturday), and passes the not-so-nice neighbourhoods of the capital before taking a winding road up to Puebla. Puebla’s location was selected by the Spanish because of the agricultural possibilities of the area, and that still proves to be true although the city nowadays has important industries too. There’s a large Volkswagen plant for example. The bus let me off at Puebla’s CAPU bus station, and from there I took a taxi into the historic center. The city is huge (1.5 million inhabitants) so you have to rely on public transport. I asked the taxi driver to drop me off at the Santo Domingo church – when I did my preparations the church’s Rosary Chapel came out as the no.1 thing to see in Puebla. It is closed during mid-day (1-4 p.m.), so I scheduled my visit for the morning. I was already happy to see the colourful exterior of this church, but I knew I had to find my way to the chapel in the back. And there it was - Wow! So much gold. “Baroquissimo” a guide described it to its group of 30 people gazing at it with open mouths. The sun lights it from above, so it all shines nicely. It’s difficult to get good pictures of it because of all the glitter, you really have to go and see for yourself. This visit alone made my day, but there was more to come. The city center is chock- full of interesting facades, with different colours, tiles and baroque ornaments. An unmissable one is the San Francisco church, which lies a bit out of the center but has the greatest facade of them all. It’s a combination of brick, yellow paint and large azulejos (see large picture above). The Zocalo was full of life, mostly local people enjoying the weekend. The city reminded me of Arequipa (Peru), another city known for its many churches with baroque facades. I only had one day here in Puebla, but it would be worth to spend the night. Grid system of roads, arcaded squares, baroque buildings and ornate Catholic Churches, it felt so familiar, but where from? Then it hit me: Kraków! (or even Wroclaw) I wasn't expecting this Mexican city to remind me so much of Poland, but that was what came to mind over our delicious dinner on our first evening in Puebla. I rather liked it here; it felt different to other cities in central Mexico. There was a rather nice and somewhat laid back atmosphere perfect for an evening paseo and a slow breakfast on a terrace overlooking the zocalo. The undoubted highlight was the Marian chapel of the church of Santo Domingo. The church was already rather impressively decorated but nothing quite prepares you for the sheer ornate “baroqueness” of the chapel proper. The other reason to visit Puebla is the magnificent food. The famous mole pueblano we tried was excellent, although another local treat proved to be even better, tinga poblana. Also if you have more of a sweet tooth it is really worth exploring Av. 6 Oriente especially at night as pretty much every shop sells an astounding amount of locally produced candies, especially camotes. I really liked Puebla, it was a lovely place to spend our last night on the road, and it even rewarded us with wonderful views of Popocatépetl puffing away as we eased our way back to Mexico City. My flight from Cancun landed in Mexico City airport around 5 AM, after checked in at the nearby airport hotel, I decided to go to Puebla immediately because it was so convenient to travel from airport to Puebla by frequent direct bus, one of many reasons why I decided to stay in airport hotel during my time in this big city. There are two bus stations for Puebla, CAPU and 4 PTE I chose Puebla 4PTE bus station as this station is closer to the city centre and historical core zone and that’s mean cheaper taxi cost. I comfortably sat on the bus with compliment drinks and snacks as well as Mexican drama on TV. The first place I visited was the famous Santo Domingo Church, at the church front yard, there was a market and fair going on, the tent obscured my view of the church, but fortunately that the entrance was still clear for me to see the beautiful white stucco on the right side of the entrance. When I entered into the church, I was already happy to see its beautiful golden altars, but when I turned left and saw the Rosary Chapel, I was so shock to see such an unbelievable and so ornate place. 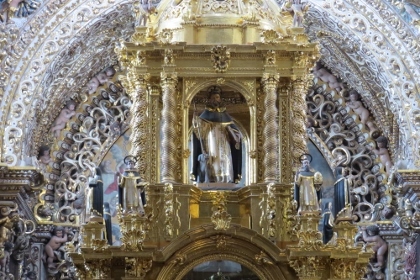 Gold is almost everywhere, the art is very beautiful as a prime example of New Spanish Baroque. Then I walked around the town, seeing market, Puebla is a very prosperous city, and looks very Spanish than I thought by its many nice decorated buildings almost every corner. 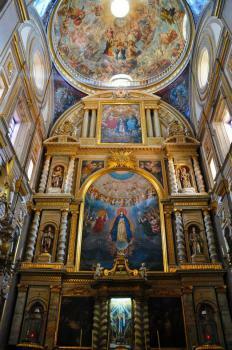 The Cathedral of Puebla is another great place to see. Its wooden doors, altar and ceiling are just masterpieces that equally impressive with many great cathedral in Europe. I also visited other public buildings and churches, all are beautiful, most of them have richly façade, and churches’ belfries are rivalling each other for more extravagant design. Before I ended my time in Puebla, it is a must to find nice restaurant to try the famous Mole Publano, and I found one near Cathedral recommended by many gourmet website. I ate stuffed omelette with Mole Publano, and it was so good that I felt that all Mole Publano I tried before was simply bad. 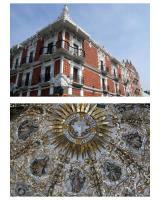 I really enjoyed my time in Puebla, the city has so many cultural heritages to see, taste and explore. Another thing I like of Puebla, they cleverly designed car park buildings to be in the middle of old colonial centre harmoniously and that can solve car parking problem which is the problem I saw in every old town in Mexico. I’m not surprised at all after visit why Mexico chose this city to be one of the first groups of their World Heritage Site since 1987, the place truly deserve the status. Puebla in my view is not only a beautiful city full of history and great architecture. Puebla has simply the greatest cuisine in America, no other city in Mexico or other country in this continent has the variety of superb dishes that Puebla has, no doubt, Puebla also has some the most valuable cooks in USA. With a population of c1.4 million, the city of Puebla was by far the largest of the WHS-inscribed provincial “colonial” Centros Historicos we saw during our tour of Central Mexico in Mar 2008 (as well as being the 7th we had visited in 11 days!). As a result I was somewhat doubtful both whether it would have preserved much worth seeing and whether it could really offer anything new. On both counts I was pleasantly surprised. The compact central area (50 blocks or so) is well preserved and conveys a distinctive impression which sets it apart from other Mexican cities. This is partly due to a significant external use of “azulejo” tiles which have traditionally been made in the region (photo 1). Most of the buildings are 19th century but with reasonably large numbers from the 17th/18th Centuries too – with the later ones managing to maintain the overall feeling of “grandeur”. 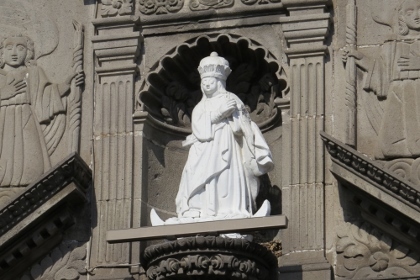 Now we were getting pretty “churched out” on our trip and Puebla’s enormous Cathedral seemed, to our taste, rather oppressive in atmosphere and mawkish in iconography. However, when we moved on the 4 blocks to the Rosary Chapel we were just “blown away” by its magnificence. Nowhere before have I ever seen so much decoration so tightly fitted in to such a large area as the walls and ceiling of this chapel (photo 2). It is of course totally OTT, but this ultimate in “Baroqueness” should definitely be seen. In my view this building alone justified our visit to Puebla! One of the “great sights” of Puebla, often portrayed in photos, is the view of Popocatapetl from there – so we got ourselves up a 6.30 am and drove up to the “Fuerte” (Fort) where the best view is achievable but Popo’ wasn’t obliging that morning! Luckily we had excellent views 2 days later from the (rather closer) town of Amecameca! 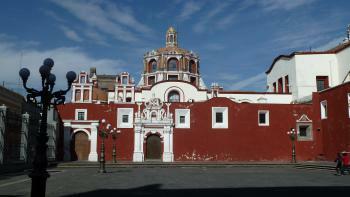 It is interesting to read the ICOMOS evaluation for Puebla. I was surprised to discover that the original proposal was to inscribe it “in tandem” with nearby Cholula – which is built on a pre-Hispanic town/pyramid. ICOMOS rejected the idea (but in the same year accepted the joint proposal for Oaxaca/Monte Alban q.v.). However the UNESCO Web Site still describes the inscribed location as including the “municipalites de Puebla, San Pedro Cholula et San Andres Cholula”. But, since the inscribed size is 597ha and the buffer zone is 102ha, it doesn’t seem likely that anywhere in the Cholula municipalities, 12kms away, would be included. 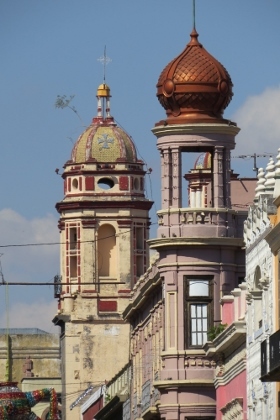 Puebla, a baroche town. But the baroche has a different meaning overthere, because it is not anymore an academic style, it is a laboratory of the style, ussing arabs, aztecs and catholics influences. The new convention center, designed by legorreta, it is a great sample of respect for the city, history, tradition. It is a panoramic balcony (360') to the town. the main view is the San Francisco church. I arrived Puebla after my high school studies to begin with my undergraduate at UDLA in Cholula, Puebla. After i came for the first time i told myself "is the right place to be, because everyday of my life here, i will have some historic place to visit" There are lots of historic elements in the city to consider the character of a "Colonial" city where you could feel the history as you had been at that time, "el cilindrero", "el algodonero", and specially the marvelous gastronomy that involves the old elements of traditional cooks with some new from the world. If you are planning to visit Puebla, let me tell you that you have chosen a really nice and interesting place to be. The original WHS nomination also included the archeological site and prehispanic city of Cholula, which lies nearby. The committee was not happy with the reconstruction principles used at Cholula and deferred that part of the nomination. Fusion: "aesthetic concepts resulting from the fusion of European and American styles were adopted locally"
136 Community Members have visited.